Our Astrophotography section is headed by Kayron Mercieca. Astronomy is a humbling discipline - the study of the Universe, its contents and the evolution of everything we are. It is a science that anyone with an interest can learn, practice and share at any level. There are two main branches of amateur astronomy - Observation and Astrophotography. The former can be practiced by anyone at any age and can capture the imagination and interest of many who may not have been initially interested. With some learning and a little practice, the equipment used in Observation can provide stunning views of the night sky's objects (dependent on site of viewing and optical equipment being used). This ultimately requires little setting up and is fairly easy to get into. The latter, Astrophotography, ranges from being relatively simple to get into (pointing a DSLR on a tripod at the night sky with semi-long exposures) to being extremely technical and highly specialised. Astrophotographers have to take into consideration the facts that the target is commonly invisible to the naked eye (requiring very long exposures of several minutes) and is constantly moving across the night sky (requiring a tripod that tracks this movement with motors). There are a large number of further complications to the whole ordeal if one wishes to get into this field but nothing that cannot be learned. What makes the entire effort and expense worth-while however, is that feeling you get when your images are captured and appear on your camera/laptop screen. I have been practicing astrophotography since September 2012 and have learned an extreme amount from sheer experience, asking on online forums and composing my own images of deep space. 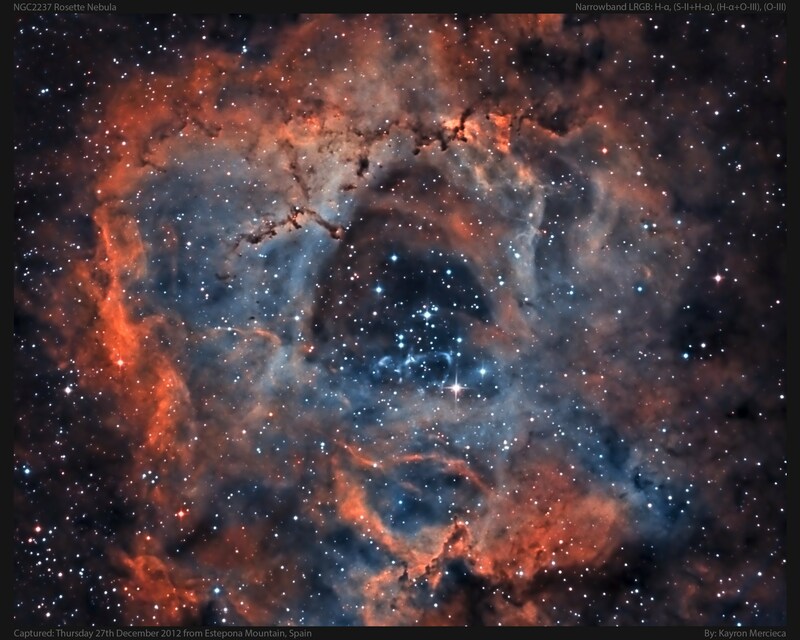 Only five months after starting, I produced the Rosette Nebula in Narrowband image, which was a finalist image in the Astronomy Photographer of the Year 2013 international competition, hosted by the Royal Observatory Greenwich. Much of my salary has been spent on astrophotography, being my main hobby and one which I adore. Shortly after starting, I set up my own blog, Light Vortex Astronomy, which has become increasingly popular, now receiving over 200 hits a day from all over the world. The main attraction is my tutorials, which are very well-written with in-depth detail. What you will find in this section is my heart and soul poured into astrophotography. Astrophotographs from members of the Gibraltar Astronomical Society, including myself, are on display. Moreover, tutorials written by myself, other members and also some useful ones found online are listed with a synopsis and are sectioned accordingly. This section also aims to discuss equipment and software used in astrophotography. Nothing replaces direct teaching however and the Gibraltar Astronomical Society aims to run courses (taught by me) which cover all aspects of astrophotography, from beginners to advanced. Above all, I am a firm believer that wanting, anybody can get into this amazing field. It simply requires practice, patience, investing in some equipment and to avoid mistakes and learn more effectively, guidance (as I sought from online forums when I started and still seek to this day!). Please enjoy this section of the Gibraltar Astronomical Society. Everything I can do to build strong ties between members in terms of astrophotography, I will aim to do. Do not hesitate to contact me at any time with any questions you may have.